This 10 Hour program is intended to provide instruction on a variety of construction safety and health standards to entry-level participants. Your employees will receive an acknowledgement of completion & wallet card upon completion of the training. This 10 Hour program is intended to provide instruction on a variety of general industry safety and health standards to entry-level participants. Your employees will receive an acknowledgement of completion & wallet card upon completion of the training. This 30 Hour program is intended to provide instruction on a variety of construction safety and health standards to entry-level and intermediate-level participants. Your employees will receive an acknowledgement of completion & wallet card upon completion of the training. This 30 Hour program is intended to provide instruction on a variety of general industry safety and health standards to entry-level and intermediate-level participants. Your employees will receive an acknowledgement of completion & wallet card upon completion of the training. Teach other general industry hazards or policies and/or expand on the mandatoryor elective topics. The minimum length of any topic is one-half hour. This program consists of classroom instruction and hands-on performance testing. The hands-on training will be conducted at your location on your equipment. Your employees will receive an acknowledgement of completion & wallet card upon completion of the training. Listed below are the topics presented. According to the manufacturer, all employees who operate heavy equipment must be trained and qualified by the company. In this course, we will train the student in the skills needed to safely operate heavy equipment. Hands-on operation will also be performed on heavy equipment provided by your company. Your employees will receive an acknowledgement of completion & wallet card upon completion of the training. Closed environments and other areas where insufficient ventilation or poor vehicle maintenance could cause a buildup of carbon monoxide or diesel exhaust. We will finish up with a written exam & open discussion. This program consists of classroom instruction and hands-on performance testing. Power point Presentation & hands on instruction will be used to discuss the general rigging procedures & OSHA guidelines. 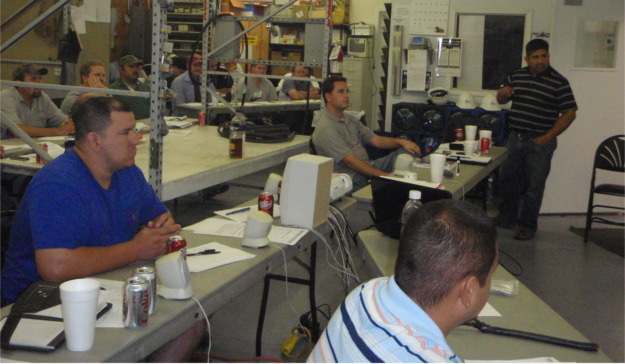 The hands-on training will be conducted at your location using your equipment. Rigger’s Capacity Card Review in Detail. Rigger’s Hand Signal Card Review in Detail. Establishing Communication- Hand Signals & Radio Communication with Crane Operators & Contractors on Site. According to OSHA (29 CFR 1910.178), all employees who operate a Powered Industrial Truck / Rough Terrain Forklift must be trained and authorized by the company prior to operation. In this course, we will train the student in the skills needed to safely operate a standard, rough terrain, gas- propane and/or electric Forklift Truck. Hands-on practice using an actual Forklift through an obstacle course is the highlight of this class. Your employees will receive an acknowledgement of completion & wallet card upon completion of the training. The purpose of this course is to provide the scaffold erector, users and scaffold inspector the knowledge of the OSHA regulations, safety guidelines, procedures and best work practices needed to recognize and eliminate hazards in the field. This course supports the designation of the competent person as required by OSHA. Your employees will receive an acknowledgement of completion & wallet card upon completion of the training. This fall protection class uses real-world examples to enhance the understanding of diverse and complex requirements under the very stringent OSHA fall protection standard. A presentation of photographs and videos of actual job-sites and hands on practice helps students to see the benefits and limitations of many fall protection systems and how they can be used to work safely. Your employees will receive an acknowledgement of completion & wallet card upon completion of the training. Fall protection systems, which include guardrail systems, safety nets, personal fall arrest systems, safety monitoring systems, controlled access zones, hole covers, and warning lines. Each system will be discussed in detail. The purpose of this class is to identify potential fire hazards at the work place, fire protection methods to include storage of flammable / combustible materials and fire protection planning. A presentation of photographs of actual job-sites and hands on practice helps students to identify potential fire exposure at the work place. Your employees will receive an acknowledgement of completion & wallet card upon completion of the training. Identify different classes of fires - Type A, B, C, D, K, Carbon Dioxide, Halogen, etc. Inspection & maintenance of a fire extinguisher - Annual & monthly inspections, charge, tank condition, etc. P.A.S.S. - Pull, aim ,squeeze, sweep. There is no excuse for a worker to be hurt or killed by a cave-in. OSHA regulations (1926.651) require that "Daily inspections of excavations, the adjacent areas, and protective systems shall be made by a competent person for evidence of a situation that could result in possible cave-ins, indications of failure of protective systems, hazardous atmospheres, or other hazardous conditions. An inspection shall be conducted by the competent person prior to the start of the work and as needed throughout the shift." This class provides the knowledge to meet this requirement. Your employees will receive an acknowledgement of completion & wallet card upon completion of the training. This course presents electrical safety information based on the OSHA Electrical safety Related Work Practices Rule. Starting with presentation on the definition and nature of electrical hazards, the course goes on to cover electrical safety equipment, safety procedures, plus legal and regulatory requirements. This course is designed to meet and exceed the safety training requirements that are defined in the OSHA Electrical Safety Related Work Practices Standard. Your employees will receive an acknowledgement of completion & wallet card upon completion of the training. Employees who “face a risk” of electrical shock that is not reduced by electrical installation requirements must receive the training. The required training is to include the practices addressed in the standard (all employees), practices not addressed but required for safety (unqualified employees), and certain voltage measurement and clearance distance skills (qualified employees). This course is designed to meet the specifications of the OSHA regulation for confined space entry. The course will give the students the skills necessary to enter and occupy a confined space such as a manhole, trench/ excavation, tank, pit, or similar enclosure that has the characteristics of a confined space. The goal is to equip the students with the knowledge of the OSHA regulations & best practices to work safely in a confined space and also determine if a confined space is a non permit or permit required space. In order to do so, this course combines classroom lecture, discussion, as well as demonstration of the typical equipment needed to perform the confined space entry safely. Your employees will receive an acknowledgement of completion & wallet card upon completion of the training. Atmospheric Exposures- Oxygen Deficiencies/Enriched, Hydrogen Sulfide, Carbon Monoxide, Methane Gas, Chemical & Environmental, etc. Rescue and Emergency Services- Inspection and Proper Fit of Fall Arrest Systems, Retrieval Systems, etc. This course will provide the OSHA guidelines and safe practices to protect employees from the contraction of disease resulting from contacting blood or other potentially infectious materials (OPIM) during the course of work. Your employees will receive an acknowledgement of completion & wallet card upon completion of the training. The National Safety Council defines Defensive Driving as “driving to save lives, time and money in spite of the conditions around you, and the actions of the others.” The term Defensive Flagging implies a similar safety outlook and emphasizes the vigilant and protective attitude flaggers should have as they protect the lives of motorists and workers. A video presentation of actual job-sites and hands on practice helps students to see the importance of safety & traffic control on the jobsite. The students will receive an acknowledgement of completion & wallet card upon completion of the training. Table 6E-1 - Determining the stop sight distance drivers need as a function of the speed. The use of Stop / Slow Paddles & Emergency Flags. The purpose of this course is to provide workers the knowledge of Hydrogen Sulfide, what it’s made and where it can be found. This course also helps to understand the health impacts & the physiological effects of hydrogen sulfide exposure and the OSHA guidelines & permissible exposure limits. The goal is to equip the students with the knowledge of the guidelines & best practices to identify & work safely in hydrogen sulfide exposure areas. The students will receive an acknowledgement of completion certificate & wallet card upon completion of the safety training. Hydrogen Sulfide - What is it? How is it made? Where is it Found? Duties and Responsibilities - Entry Supervisor, Attendant, Authorized Entrants, Rescue Personnel. Atmospheric Testing - Oxygen Deficiencies, H2S Exposure, etc. The First Aid/ CPR/ AED course is designed for those individuals who may need to respond to a medical emergency on or off the job. With a combination of real-life examples and actual emergency situations, the student will leave the course confident that they have the skills needed to assist an injured victim during the critical time before medical help arrives. The course is essential for employees designated as first responders. The students will receive a certificate of completion & wallet card upon completion. In order to work on many of the operating oil companies work sites, contractors are required to complete the Safe Land & Safe Gulf USA orientation for their personnel. This program will assist your company in maintaining compliance. The students will receive an official photo-ID badge indicating they have completed the Safe Land & Safe Gulf USA orientation.